Did you know Easter is my favorite holiday? I love it for all it stands for but I also love, Easter bunnies, flowers, and spring time! Easter has always been the holiday closest to my heart religiously....... and because of CADBURY EGGS! OH, OH, OHHHH I love Cadbury Eggs! I mean, let's be real, I have been through a bag of these already. I stalk the Easter aisle at every store. I hoard these babies. These cupcakes are SO fun. They take one batch of a recipe I have already posted on Chefwannabe and some cupcakes. Now as I always say, if you have a cupcake recipe you LOVE, use it. I used a box. You know why? Because I did. That is why. I was at my parents and doing this project with my ma, so I wanted it to be quick, she has little to no attention span and her OCD about each cupcake having different colored eggs almost drove me nuts. I love ya ma, but Lord help me. HAHA! Just get some cupcakes. Chocolate, vanilla, whatever you like. You should have plenty of topping for all of your cupcakes. Make sure your cupcakes are cooled. Use about 1 heaping teaspoon of haystack mixture for each cupcake. Use your spoon to make a dent in the middle and place your eggs snugly in. This would be awesome for kids to do!! 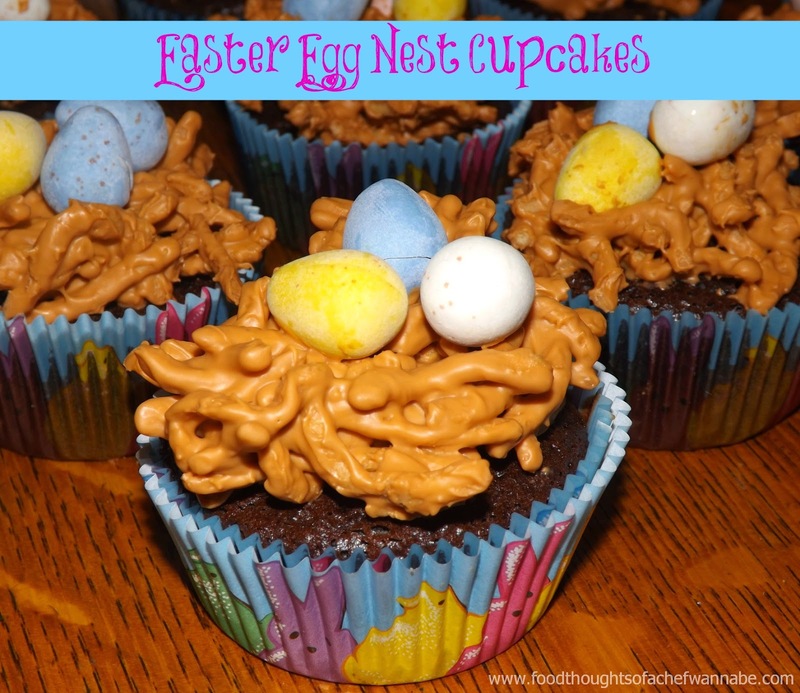 I did them with my mom, that turned out not so awesome because after she ate 6 eggs, did 4 cupcakes she did this to me, with God as my witness she pushes it away from her and says, "ok this isn't fun anymore because I don't have enough blue eggs". GAH! When you are all done, let them sit, or refrigerate until set. Little festive cupcakes for Easter! Enjoy! And by an extra bag of Cadbury Eggs! !